Beavers are rodents and belong to the same family as squirrels, rats and mice. They are usually dark brown in color. They have a flat tail that looks much like a Ping-Pong paddle. Their teeth, which are huge and yellowish, grow all of their lives. Beavers have body oil which they use to coat their hair which helps to keep them warm in cold water. The fact that they have webbed feet makes them fast swimmers. 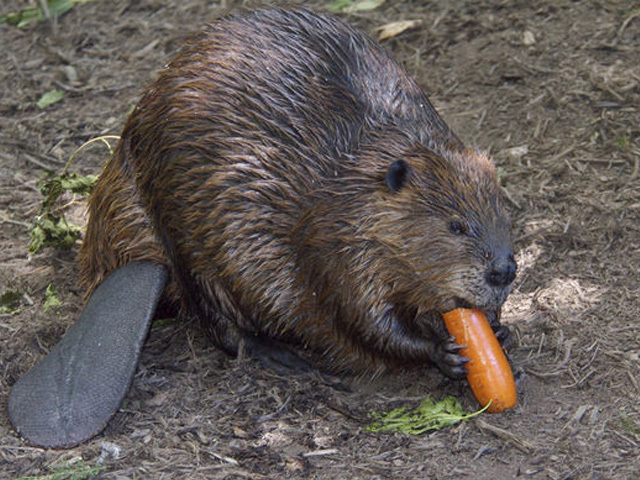 Most beaver are found in the middle and upper part of the United States and in Canada. Beavers are mostly vegetarian, they are herbivorous animals. That is they eat leaves, and crops, such as apples. They also eat fish, but only if they find them dead or if the fish come too close to their homes. They do not hunt for them. They store their food in the underwater tunnels of their homes. Beavers live in lodges made of twigs and mud. They build these lodges in water. They live in the top part which is above water and store their food in their underwater tunnels. Beavers can travel both in water and on land, although they can travel much faster in water. When they go under water, their ears and nostrils close up. Beavers can hold their breath underwater for long periods of time, sometimes as long as ten minutes. Beavers stand up on land by using their back feet and their paddle like tails. Beavers cut down trees and make dams so that the water will be deeper in their home areas. They are very good at making trees fall exactly where they want them.